If you like "D" necks and jumbo frets, this could be your ultimate S-type. Suhr's Scott Henderson model combines classic features with smart refinements resulting in a hi-performance player's config. Besides the Landau pickups and SSC noise/hum canceling system, this model incorporates a classic Fender 6 screw bridge with a very simple mod to help keep it in tune. It's quite possible that between the Suhr Scott Henderson and a well set up Fender EJ, you'll find the essence of ultimate Stratoliciousness, and would never need anything else. But then again, G.A.S. has no known cure. 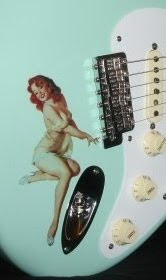 The Music Zoo currently lists this guitar as new with case, cert and all the goodies.